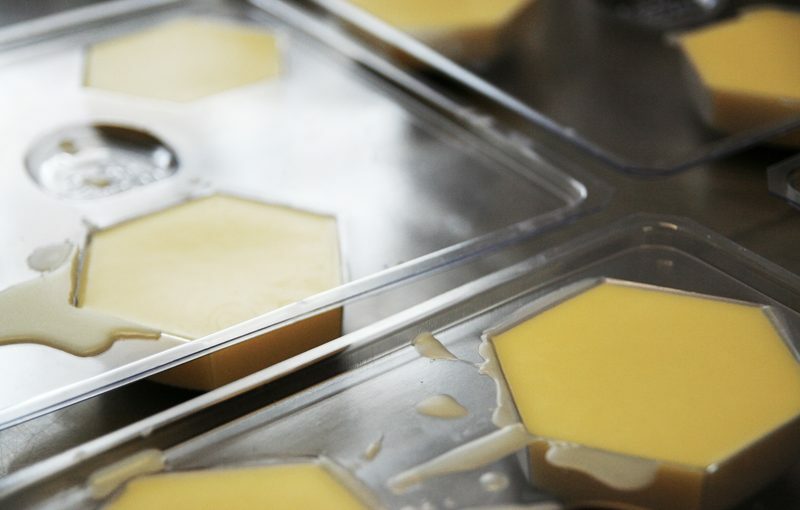 Beautifully fragrant, floral and sweet… beeswax. It was like every beeswax candle lover’s dream. 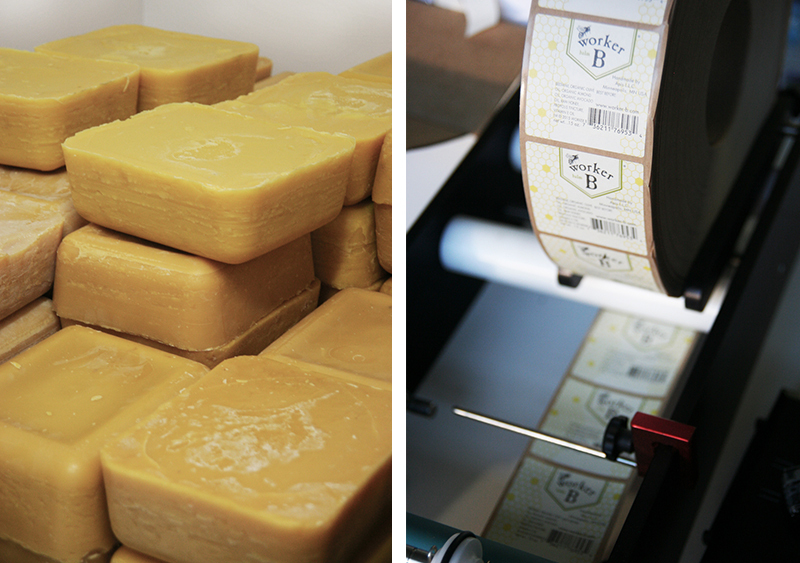 Worker B’s studio was like stepping in to a beeswax heaven. The smell is not over powering, it has subtle hints of a beautiful clover patch, beautiful florals and of course natural wax. They could hardly get me to leave, I almost hijacked one of those huge massive beeswax bricks and brought it home with me.. but I did not think I could carry it out. I have become very passionate about what I am putting onto my skin and have been seeking out companies that make skincare products that have the same values that I do. The thing that drives me most crazy about this is that now a days you have to be a chemist to know what you are putting onto your skin and in your body, and that just simply does not make sense to me. Every ingredient in Worker B’s skincare line I can pronounce. They pride themselves on creating a product that they feel comfortable using, is non-toxic and that every ingredient has a purpose for being there and is on the label! Michael Sedlacek and Liesa Helfen, co-founders of Worker B were so kind to have me visit their space, give me a tour and answer some of my questions about their company and products. They are also offering a giveaway to one lucky winner. See entry details following the interview below! How did you get started creating your passion into a business? How did Worker B come to fruition? Like many entrepreneurs, our calling was a matter of necessity. We ended up manufacturing pure bee-based skincare products through a combination of factors, including chronic skin care issues for which we couldn’t find a solution, employment at a local apiary, and concern with the source of ingredients used in skincare. Five years later, here we are – a three-person company founded on the concept that a successful business is not a zero sum game. We believe that it is possible to run a business that benefits everyone – its owners, its customers, the bees, and the world. 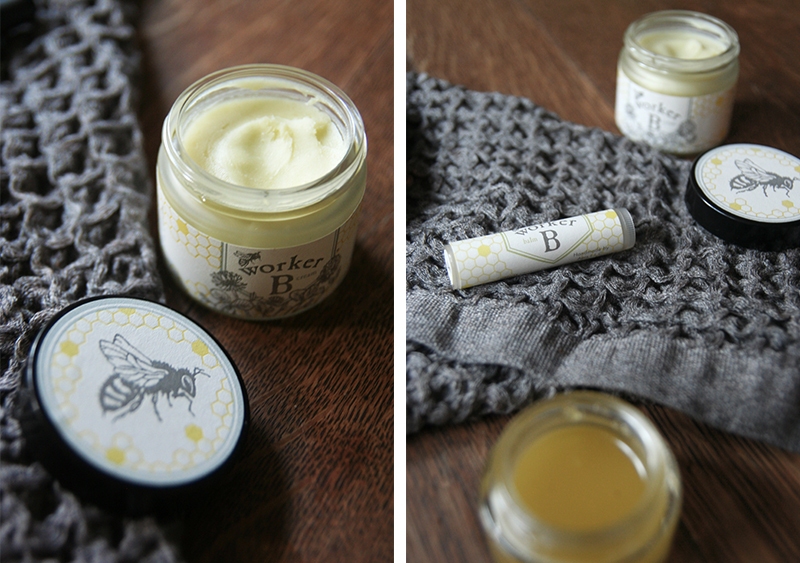 The purpose of Worker B is to create effective skincare solutions. Co-founder Liesa Helfen, has always had a variety of skin conditions; water based eczema, dermatitis, etc. She found that while pouring beeswax candles at a local apiary her skin conditions had not only a marked improvement, but also a decrease in the number and severity of breakouts. Co-founder Michael Sedlacek was looking for a longer lasting solution to his chronically abused hands. Satisfying these two needs is what set the foundation for the Worker B product line. Where is Worker B located? Worker B is located in Northeast Minneapolis in the Northrup King Building – a huge art, crafter and small business hub. We have some dedicated studio hours and always by appointment! Our customers and their very detailed testimonials! What is the difference about the products you sell in comparison to other skincare products out there in the market? All of our skincare formulations are water-free (anhydrous) and filler-free. Our products are highly concentrated, with no small proportion ingredients. It all starts in the beehive. We do keep a series of our own beehives and source exclusively from chemical and antibiotic free hives. Furthermore, we work with only non-migratory beekeepers, meaning that these honeybees are not shipped around the country for commercial pollination. This assures us that we are starting with the purist beeswax, raw honey and bee propolis possible. We extend this approach to all of our ingredient sourcing. As a consumer, why is it important for me to be conscious about what I am putting onto my skin? What you are putting onto your skin should be just as important as what you are putting into your body. What you apply topically to your skin gets directly absorbed into your system. Skincare ingredients have often been overlooked. Over the pastnfew years we have seen consumers care much more about the label, they read the ingredient list and ask more questions about their personal care items. This is a good thing! It seems we aren’t the only ones who have developed persistent skin conditions. Can you explain in-depth why you choose to source from non-migratory, chemical-free, antibiotic-free and pesticide-free beekeeper’s hives? Why is this important for our health and the environment? We source only from these types of hives/beekeepers for one main reason – purity of ingredient source. With beeswax, raw honey and bee propolis being a major component of all of our products, it is especially important to know where they are coming from. Also important is to know what processes are used not only to keep the bees, but also in how the final products are harvested and rendered. Having a close personal relationship with all of our beekeepers is what sets us apart from other “bee-based” companies. With all of the challenges facing the honeybee (and all pollinators), knowing your beekeeper is important. Sourcing from these types of hives assures us that we are working to promote the continued survival of the honeybee and not just using them for commercial purposes. Why do you choose to be completely transparent with what you are putting into your products? As a consumer, how do I know if a cosmetic company is transparent with sustainable, non-toxic practices? It is a consumer’s right to know what they are putting on their skin. By and large most companies do disclose a full ingredient list but the regulation in cosmetics is somewhat of a grey area. We don’t consider “fragrance” to be specific enough and we also don’t believe in “ingredient dusting.” This is where a product is highlighted for a special ingredient and marketed for that ingredient, but then such a small amount is included in the final product putting its actual benefits into question. It means just that – water free! Water based formulas create a need for a plethora of emulsifiers, stabilizers and a whole preservative system and dilute that concentration of useful ingredients. Water free formulas put the focus on only the most beneficial ingredients. We feel that this makes not only a more effective product, but also a higher value one. Why is raw honey, beeswax and other ingredients from bees so great for our skin? Throughout history, beeswax has acted as an emollient humectant; raw honey for antiseptic applications; and bee propolis for regeneration. Please note that ingredient statements are provided for educational purposes only and has not been proved or disproved by the FDA. All of these bee products were heavily used in the mummification processes for their preservative properties. Bee Propolis is a resin made by the honeybee and is the anti-fungal and anti-microbial agent of the hive; much like the immune system of the beehive. 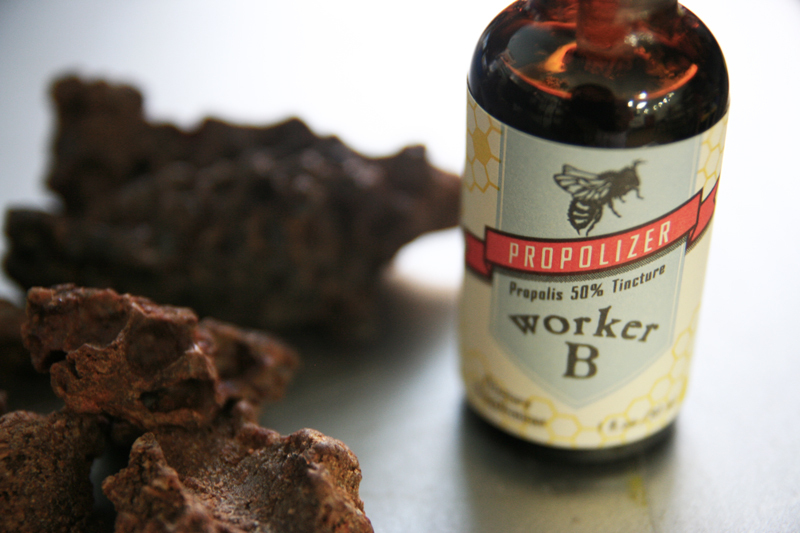 The Propolizer is a dietary supplement made from the organic grain alcohol extraction of bee propolis. This extraction makes the bee propolis into a form that our bodies can readily absorb and put to use. What are challenges you encounter by being a business owner? Our biggest challenge at the moment is brand awareness. We believe that we create products that are effective and serve a real purpose – and we have the enthusiastic and loyal customers to prove it! Now we need to bring this product line to a wider audience. Michael: Time is tight and I haven’t been hitting the books as much as I would like. Haruki Murakami and David Mitchell’s latest novels are next on the list. Liesa:Ha! Currently I am mostly reading a myriad of native tree/plant books for oak savannah areas as I am trying to plan out a restoration project for the land I purchased in Wisconsin for the bees. What is your favorite quote or mantra you live by right now? How can I get involved and help support my local bees? Supporting local bees is more than just starting a beehive! Planting native and pollinator friendly plants provide forage throughout the summer and combat the loss of natural habitat that all pollinators are currently facing. 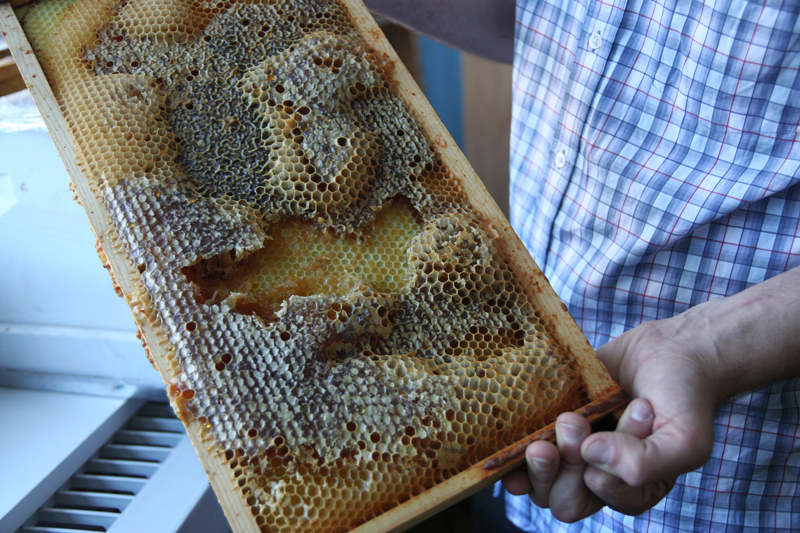 Supporting local and sustainable beekeepers is also very important . . . and often gets you the tastiest honey! Lastly, how can I support you? Where can I buy your products locally and nationally? Can I purchase them online? Online: Worker B products are available through the website (Worker B) and at variety of locations both locally and across the country. In Person: You are always welcome at our Minneapolis studio . . . or catch us in person at one of our upcoming events. My friends Michael and Liesa with Worker B were kind enough to offer one lucky reader a chance to win two products of their choice from their skincare line! To enter, visit their website here to see the list of skincare products they carry and leave a comment below with your two favorite skincare items you would like to win! Feel free to include links to your favorite and say why you would like to try this product or if you currently use it, I would love to see what you are into! Hoping to win the Raw Honey Face Wash http://www.worker-b.com/shop/skincare/raw-honey-face-wash-normal-dry-skin/ and Dawn Serum http://www.worker-b.com/shop/skincare/dawn-serum/ . They look incredible! I’d like to win the cream because it says it can be used on my pets’ space pads! Also, the dawn serum because it could simplify my morning routine. What an awesome giveaway!! I would love to win the dawn and dusk serums because I want to start my day and end my night right! I would love love love to try the Cream, and the Dusk Serum. What an awesome product line – so hard to choose! I have heard about these products and/or saw them at the farmers market… I would love the cream! Thx! This is such a great interview, thank you so much for introducing me to this product. I love their branding and logo, I can not wait to try this stuff! I hope to win the Raw Honey Face Wash and Dusk Serum! !